Are you ready for the new season of Project Runway All Stars? Lifetime just announced season six will debut in January. The new season will feature the return of host Alyssa Milano as well as judges Isaac Mizrahi and Georgina Chapman. Guest judges will include Catherine Zeta-Jones, Whoopi Goldberg, Dita Von Teese, Jesse Tyler Ferguson, Olivia Culpo, RuPaul, and Kelly Osbourne. 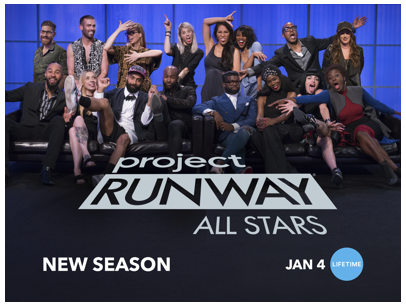 Season six of Project Runway All Stars premieres on Lifetime on January 4th at 9 p.m. ET/PT. New York, NY (December 11, 2017) — Sixteen talented designers will compete for a second chance at runway gold with the return of Lifetime’s hit series Project Runway All Stars, premiering Thursday, January 4 at 9pm ET/PT. Eight All Stars veterans will go up against eight former Runway designers making it to the All Stars battle ground for the very first time. Alyssa Milano returns as host with judges Isaac Mizrahi and Georgina Chapman and Anne Fulenwider, Editor-in-Chief of Marie Claire joining as mentor. Guest judges strutting down the runway this season to see who has the skills to make it to the end include Catherine Zeta-Jones, Whoopi Goldberg, Dita Von Teese, Jesse Tyler Ferguson, Rebecca Minkoff, Danielle Brooks, Olivia Culpo, Rosie Perez, RuPaul, Kelly Osbourne, Karolina Kurkova, Kasey Musgraves, and Project Runway’s Nina Garcia and Zac Posen. What do you think? Are you a fan of Project Runway All Stars? Will you watch the new season? I’ve had my fill of any and all Project Runways. This past season was a fiasco and too much drama. Project Runway whether all stars or prospective designers is off my list. It could be cancelled and I could care less.